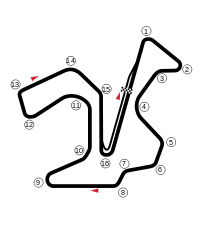 The 1986 Spanish Grand Prix was a Formula One motor race held at Jerez on 13 April 1986. This was the first Formula One Spanish Grand Prix since the 1981 race was held at Jarama. This race featured a 3 car battle for the lead over the last half of the race. Ayrton Senna (Lotus-Renault), Nigel Mansell (Williams-Honda) and reigning World Champion Alain Prost (McLaren-TAG) all had opportunities to take the win, with close nose to tail racing around the circuit. Once Mansell pitted for fresh tyres he charged back into the fight making up over 19 seconds in the final 10 laps on his fresh rubber. It was not quite sufficient to take the win, but it was very close with Senna and Mansell taking the chequered flag almost side by side, Senna only 0.014 s in front of Mansell in one of the closest finishes in Formula One history. In an interview after the race, Mansell said he had no problems with Senna's defensive driving (blocking) at the end of the race when the Williams was clearly the quicker car, saying that Senna was entitled to protect his lead. He then jokingly added that the finish was so close they should give them both 7½ points each. 3rd Grand Prix victory for Ayrton Senna and the 76th win for Lotus. It was also the 19th win for a Renault powered car. 9th pole position for Ayrton Senna and the 100th for Lotus. It was also Renault's 44th pole position. 100th Grand Prix start for Keke Rosberg. 350th Grand Prix start for Team Lotus. 1st Grand Prix finish for the Haas Lola team and the final finish for the turbocharged Hart 415T engine. This was the third-closest finish in Formula One history, after Mansell's spectacular charge allowed him to pull alongside Senna on the final straight. ^ "1986 Spanish Grand Prix". formula1.com. Archived from the original on 13 November 2014. Retrieved 23 December 2015. ^ a b "Spain 1986 - Championship • STATS F1". www.statsf1.com. Retrieved 20 March 2019.